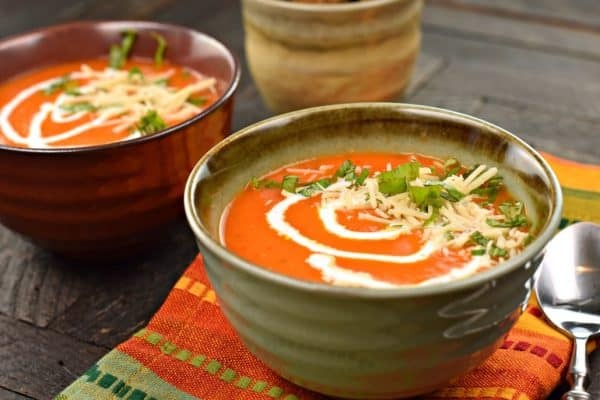 Make this Roasted Tomato Soup recipe using fresh or canned tomatoes. I’ve got tricks on how to freeze your tomatoes fresh from the garden too! You’ll love the texture and taste of this soup, and may never eat canned soup again! There’s nothing like a bowl of roasted tomato soup to make you remember childhood. Except, it turns out, we all have different “dunking” preferences. For instance, my husband loves to dunk his grilled cheese sandwich into his Roasted Tomato Soup. I find that gross. I like them separate, but not dunked. Now that I’m a grownup though, I like to make grownup food (well, besides these Perfect Rice Krispie Treats, I mean, grownups LOVE them too)! No more cans of soup in our house. Especially since making this Roasted Tomato Soup is so incredibly easy. Every year, I grow a ridiculous amount of tomatoes in my garden. I like to be able to make homemade spaghetti sauce and can a ton of salsa! Plus, extra tomatoes for chili in the winter is always a lovely thing! Two years ago I learned a lifesaving trick with tomatoes. If you’ve ever canned tomatoes you know what a mess it can be to blanch them, peel them, dice them, etc. I usually end up the day with shriveled fingers that have burns on them from the hot tomatoes. Yes, you read that correctly. I scoop out the stem, wash and dry them after picking them, then slide them (single layer) into freezer safe ziploc bags. Stack those bags in the freezer (I usually end up every summer with about 12 bags of tomatoes, which is A LOT). When a recipe calls for “stewed, diced, or crushed tomatoes”, I grab my frozen ones instead of a can. Run the frozen tomato under cold water for about 15 seconds. Now, how about we get to making some homemade Roasted Tomato Soup! You’ll want about 12 Roma tomatoes for this recipe, cut in half lengthwise. I’ll be using frozen tomatoes, but feel free to use fresh! Toss them in a bowl with your olive oil, salt and pepper. You’ll roast these in your oven at 400°F for 45 minutes. From frozen they take a little bit longer, just check them at 45 minutes. Now for the fun part! Blending! You can add your tomatoes to a LARGE blender to get them pureed. 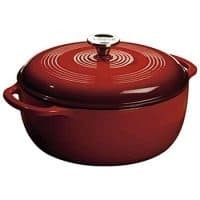 I personally pour them into a soup pot (I love this Cast Iron Dutch Oven) and then I use an immersion blender to puree my tomatoes. I find it works amazing, and gives me less dishes and mess than trying to do all this in the blender. Once I’ve pureed my tomatoes, I add the remaining ingredients to my soup, and heat over low heat and simmer for about 30 minutes to an hour. The longer you simmer, the more flavor it has (and a better color and texture too)! When I’m ready to serve I drizzle a little bit of heavy cream into the bowl and top with croutons (or serve with a side of peanut butter sandwiches, haha)! Don’t forget a pinch of parmesan cheese and fresh basil too. My family could eat soup every night for dinner. 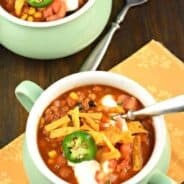 I love how easy most soups are to whip up and serve. 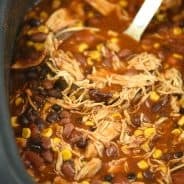 This BBQ Chicken Pizza soup has all the delicious flavors of your favorite pizza….in a soup. You’ve got to try this one! Joanne, my blog friend from Fifteen Spatulas, makes this wonderful Tortellini Soup! It’s the perfect weeknight meal, and I love the andouille sausage too! Rachel, from Rachel Cooks, makes a 20 minute Turkey and Bean Soup. Healthy and easy, I LOVE IT! Of course, the most popular soup recipe on my website is this Copycat Panera Broccoli and Cheese Soup. Kid and adult approved, see why so many people LOVE it. 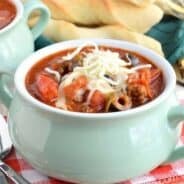 Delicious, easy, homemade Roasted Tomato Tortellini Soup recipe. You’ll love this restaurant quality soup that’s full of flavor and easy to make! 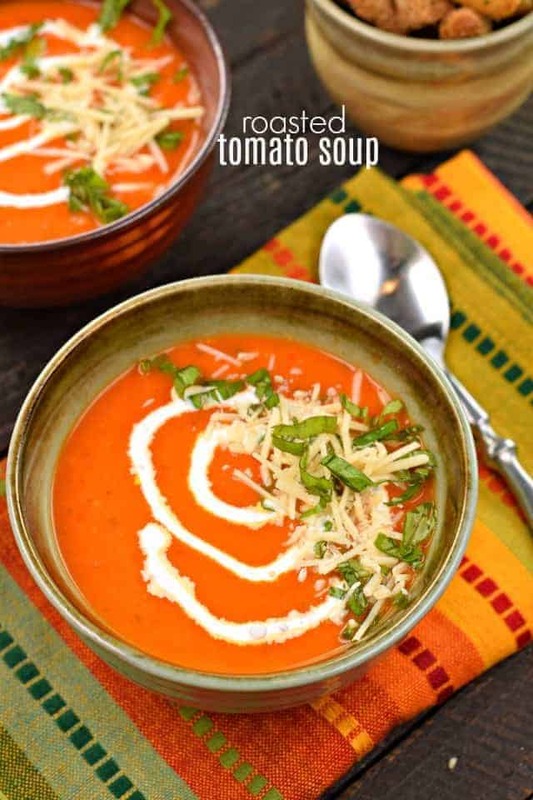 Make this Roasted Tomato Soup recipe using fresh or canned tomatoes. I've got tricks on how to freeze your tomatoes fresh from the garden too! You'll love the texture and taste of this soup, and may never eat canned soup again! Slice tomatoes in half and stir together with olive oil and cloves of garlic. Pour onto a roasting pan and sprinkle with salt and pepper. Roast in oven at 400°F for about 45 minutes. 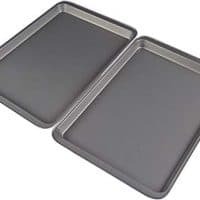 Remove from oven and add contents of roasting pan into a dutch oven or large soup pot. Add in basil. Using an immersion blender, puree until smooth. 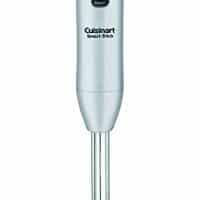 If desired, you can puree in a blender (instead of using an immersion blender) and pour pureed contents into the soup pot. Add oregano and heat over low heat, covered. Simmer for about one hour, stirring occasionally. When ready to serve, drizzle heavy cream into bowl and top with parmesan cheese, fresh basil, and croutons! ENJOY! The consistency of this soup looks so fantastic! Perfect winter food!! This soup was so delicious! The roasted tomatoes make it super flavorful!! Thanks for the recipe. This looks so creamy! 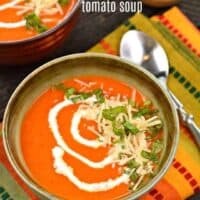 I love tomato soup and need to try this one ASAP! Whoa! You just blew my mind with the freezing trick for peeling tomatoes. I think I love you! I have to try that. I love roasted tomato soup and we make it all the time but I usually just leave on the skins. My tomato plants went nuts this summer and I still have some tomatoes ripening! Soooo good, roasting much such a big difference! 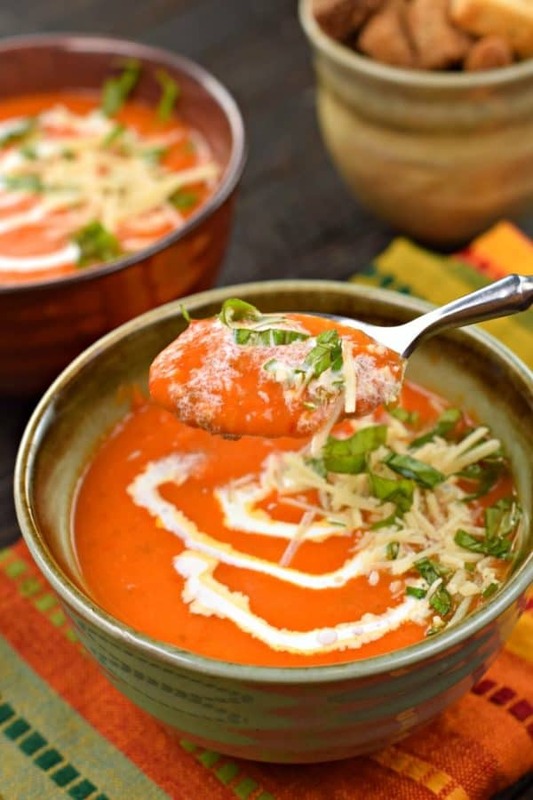 I LOVE tomato soup and this roasted version looks like perfection! Pinning for later!